Sneem is a charming village on the Ring of Kerry, the most scenic route in Ireland. 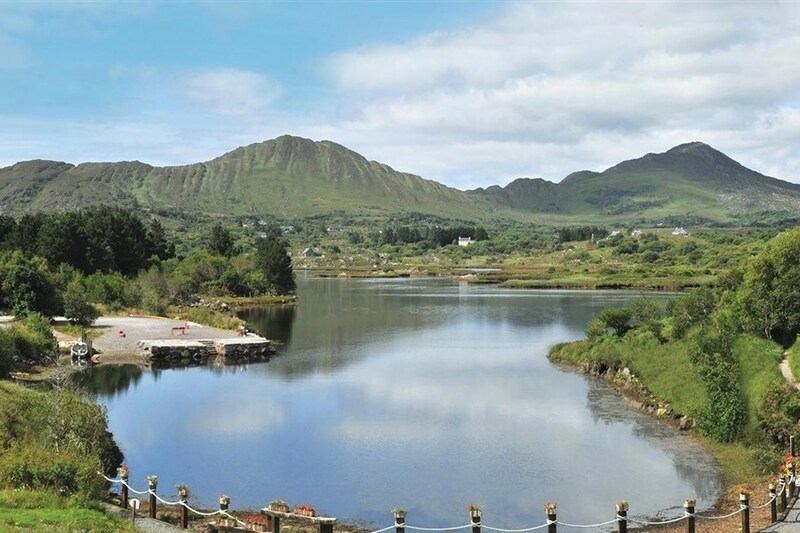 While many tourists pass right through, very few get the chance to experience the tranquillity of Sneem Hotel situated in the midst of these beautiful natural surroundings and perched on the edge of the MacGillycuddy Reeks mountain range and Kenmare Bay. The hotel has recently added a Tesla charging station. We had the most amazing break in Sneem Hotel.... even though it was only one night.... it was great to get away.... the staff are so nice and I would highly recommend it to anyone to a break away. A very enjoyable stay at your hotel, such nice and helpful staff. The food at breakfast and dinner could not be any nicer and we had such a lovely room. We will be delited to recomend your hotel to our family and friends. God Bless, Gerry, Maura. We had a fantastic stay in a beautiful room. The staff were wonderful and most helpful. This is our second time back to this hotel we love this hotel and the area, will be back again. Sneem Hotel is one of the best hotels I have stayed in. It has everything you need for a very relaxing and comfortable weekend. The bar food is lovely, the restaurant first class and the staff are so helpful and nice. The view from my room was breath taking especially at sundown with the sun setting behind the mountains, reflected in the water. The short walk along the shore line back into the town of Sneem has great views of the inlet and the town. I would recommend this hotel to anyone. Rooms are spacious and have everything you could need. The Bar and Restaurant are very relaxing and friendly atmosphere. A perfect break. Stayed in Sneem hotel for 3 nights during Halloween mid term break with family, 2 girls (10 and 7) and 3 month old. The receptionist in the hotel advised us to go into the village for trick or treating and our girls had a great time with all the shops and bars welcoming the trick or treaters with bucket loads of goodies. The hotel is modern and clean and all staff are very friendly, food is very good including the evening meal that was included in our package. The Sneem area is absolutely beautiful, including the nearby Derrynane Strand which is fabulous. We'd absolutely recommend this hotel for a family break. A very good hotel with lovely staff. We have stayed here a few times and look forward to going back again and again. nice hotel,the food was massive ,well looked after,would visit again. Sneem Hotel is pet friendly and thats what makes the difference between us going away and staying at home. Our dog can come with us and enjoy the most pleasant surroundings and beautiful setting. Why shouldn't he sit outside on the patio enjoying the breath taking views with us. Food excellent and staff are a credit to the establishment. This was our fifth visit to Sneem Hotel and have really enjoyed each time , good food very pleasant staff looking forward to our next visit. Had a really good time here. Staff were fantastic and the food is just so good. There was entertainment on in the bar on Saturday night and that was really good. My only objection was the room we were in was at the front of the hotel not to good of a view and we asked would it be possible to get a room to the back of the hotel there was a room available for the two nights that we were there but they wanted to charge €20 extra per night for the privilege be warned. Everything else was ok.
Fabulous hotel with stunning views. We asked for sea view rooms and were not disappointed. Large, bright, clean and fresh accommodation. They had new staff in who were a little bit muddled at times, but generally very nice. My only down point would be charging €3.50 for a bucket of ice and €5.00 if you want glasses with it! Would visit again. A lovely break. A lovely hotel in an amazing setting. Staff very helpful and friendly. Would highly recommend. Lovely hotel, very comfortable bed and pillows, clean rooms. Ask for a sea-view room if available. Very friendly and helpful staff. Would stay again. Lovely hotel,clean comfortable rooms,friendly staff and lovely food. Excellent hotel in a beautiful setting. Beautiful hotel. Good food. Friendly staff. Great place for a break. We have stayed at this hotel four times now and it is still one of my favourites in all of Ireland. We were given a large room with a view of the lovely bay and although the weather was wet it was nice to look out at it. The food was excellent with plenty of choice for dinner. If you wanted steak it was €5 supplement and lamb at €10, which I thought was excellent but too dear. There's plenty of fried food and fruit and cereals for breakfast but no continental as in ham, cheese or smoked salmon. There is also good wifi throughout the hotel. We are looking forward to our next stay which hopefully will be soon. Great hotel to stay in for a relaxing break with beautiful views.Rooms very spacious and clean.Service throughout all areas of the hotel excellent and fantastic food and great portion sizes.Would visit again soon.Staff were very helpful in all areas. Fabulous hotel. Bar food was delicious. Rooms are well appointed. Shower was fantastic. Staff were very friendly and courteous. Would definitel stay here again. Terrible weather but beautiful room with fantastic view and really lovely staff. Great break! We had a fantastic stay in the Sneem Hotel. Great place to relax and have a quiet weekend away in quaint location. Perfect for a quiet weekend away. Food and room was excellent. Staff very courteous. Beautiful location!! Much more than a four star hotel. excellent service, staff, food etc. Really enjoyed time spent here and great base for cycling holiday . Hotel: Modern and fresh Room: Bedroom clean with comfy bed, bathroom clean with supply of soaps, shower gel etc., clean towels available daily. Multi-Channel TV, coffee/tea facilities and secure safe. Bar: Well stocked with supply of craft beers. Breakfast: All you can eat cooked breakfast as well as cereals and breads. Evening Meals: Good selection of starters and main courses. Staff: extremely friendly, courteous and helpful. 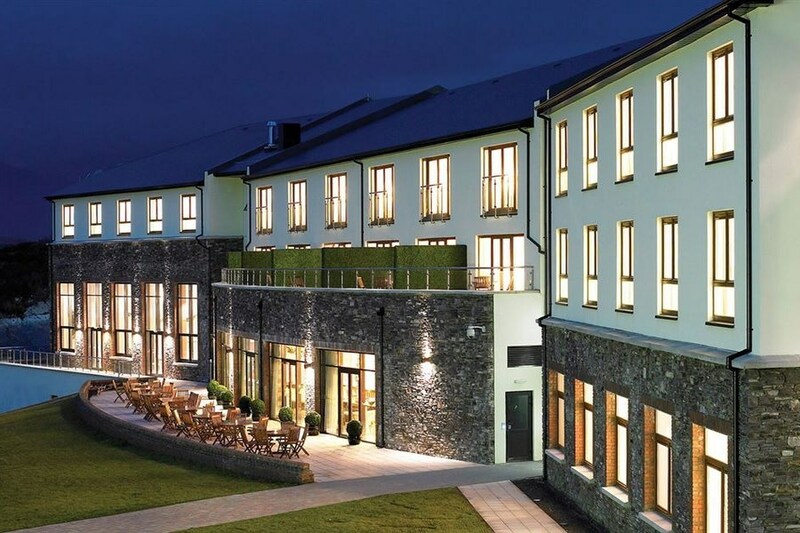 we had a wonderful two nights stay in the Sneem Hotel the Saturday and Sunday 17th and 18th of October, the hotel is very clean and well taken care of, the staff are very friendly and helpful. Our room was lovely and big, very clean, the bathroom was sparkling, the food in the bar was very good and the service was also very good. we ate in the restaurant the second night and our waitress was very friendly and made us feel very comfortable. the food was very good. the hotel grounds are beautiful and you can take a lovely walk close by. all in all it was a great break in a great hotel. fab hotel very pleasant staff rooms very spacious and clean great location we could not fault this hotel in any way . My family and I enjoyed a one night stay at the hotel. We were guests at my sisters wedding . Facilities at the hotel were excellent . Rooms were comfortable and modern and the food was great. We would like to stay at this hotel again in the near future. Overall, I had a lovely time in the hotel. The rooms were lovely and spacious and clean. The staff were very friendly and accomadating. Breakfast was good and the dining room was lovely with nice staff. The hotel was very nice upon entering, however, I thought the outside was quite shabby, and when we pulled up I thought it was not going to be nice inside, which it is. The main entrance needs a bit of TLC and I felt it was a terribe pity that something so small should be neglected. Also, the single beds pushed together to make a double were at different heights. I let the receptionist know this before leaving. Its lovely hotel that just needs a little more attention. Other than that I would recommend it. Great weekend at the Sneem hotel. The rooms were nice and very clean, the staff are quite friendly and the views are gorgeous. The leisure facilities are not the best so I wouldn't recommend if you are looking forward to a nice bubble in a hot tub or relaxing in the sauna, not well taken care of like the hotel itself. Overall I would recommend. Great value, wonderful staff, view, food and all in all the best deal ever. Our stay was 3 night B&B with evening meal super relaxing Hotel, we loved it,staff very helpful ,room great, food lovely.Great views ideal location for the Kerry way ,Sneem was beautiful,Skellig Michael,Derrynane,basically everywhere. Would return again loved it. Stayed here for or 20th Wedding Anniversary on the weekend of the 21st June. We found the hotel to be a great get away. When we arrived our room was not ready so we were changed to one of the sea view rooms and this was brilliant, with a floor length double doors to open onto a breathtaking view of the sea and the mountains in the background. We had dinner there the first night as we were on a 2 night 1 dinner package and the set menu had everything that you could want including a melt in the mouth steak. The bar also had a guest Blaskett blonde beer that was very drinkable and served Dingle gin which is comparable to Bombay Sapphire . Lovely hotel in a lovely setting, near the village and ideally situated to see Iveragh Pennisula. Please stay there. Stayed at Sneeem Hotel for one night on June22nd and it was fantastic.Beautiful setting,spacious rooms and food was excellent.Great entertainment in the bar and a friendly atmosphere.We will definitely return in the future. Lovely Hotel, amazing views, Staff very friendly. Will return. My wife and I had a wonderful break in the Sneem Hotel in June. During our three day stay the staff were helpful, pleasant and courteous. The surroundings of course are wonderful and relaxation never a problem. The room was well appointed and the food enjoyable. The break represented great value for money and a further visit in the Autumn is something to anticipate. We enjoyed our stay only wish it was for longer. The hotel staff were very professional , the town itself was warm & inviting to wander around . We stayed in the Sneem Hotel in April and this was our 4th or 5th time visiting. That probably tells it's own story. We love this hotel very much for its location, its comfort and its staff. We booked reasonably late due to a family bereavement and were thrilled to discover that we were given a suite overlooking goldenseal cove inlet. This has to be experienced...a beautiful view which always what's my artistic appetite. The room was very generous in size, spotlessly clean and extremely comfortable. Talking about appetites...the food is superb. The staff are , as ever the jewel in the crown and each member deserves great praise. It is just a stroll down to Sneem village or you can journey out to Caherdaniel and Cahersiveen or of course to Killarney. The road to Cahersiveen is awesome by the way. Over all it was a most enjoyable holiday break. Will be back........again? 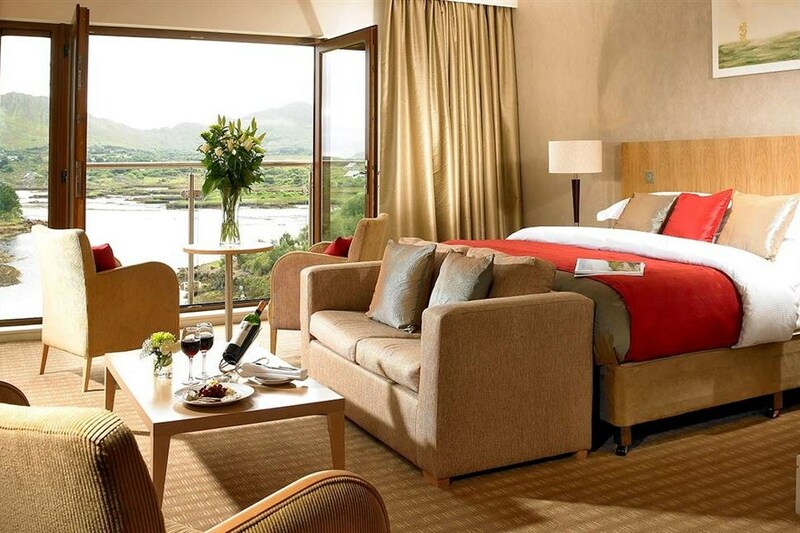 The Sneem hotel has a wonderful setting and has fab views of the area. The hotel was of a very good standard, modern but very tasteful. The room was spotless and the food mouthwatering. The staff were most helpful. Well worth a visit, would recommend and I look forward to a return trip.